CEOs from the G20 Advisory Group of ICC met in Saint Petersburg with more than 400 other business leaders and top government officials, including Russian President Vladimir Putin. 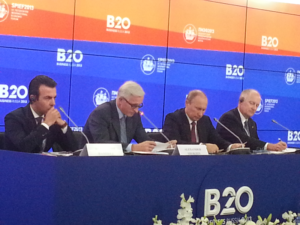 The meeting was held in conjunction with the Business-20 (or “B20”) sessions taking place under the theme “B20-G20 Partnership for Growth and Jobs” in preparation for the G20 Summit to be held in Strelna, Russia from 5-6 September 2013. ICC Chairman-elect Harold (Terry) McGraw III, serving as co-chair of the B20 task force on trade, and Chairman of the ICC G20 Advisory Group Marcus Wallenberg, serving as co-chair of the B20 task force on investments and infrastructure, were among those who met Mr Putin and put forward priorities on behalf of international business. “Open cross-border investment is an essential contributor to growth, development and jobs. G20 leaders should advance an international investment agenda by agreeing on a set of recommendations governing a high-standard G20 multilateral investment framework to be endorsed by all G20 governments. The 2012 International Chamber of Commerce (ICC) Guidelines for International Investment should be used as a template for such a framework,” Mr Wallenberg said. ICC reminded G20 policy-makers that despite recurring pledges to roll back protectionist measures, the G20 is failing to demonstrate global leadership on trade openness. The ICC Open Markets Index 2013, released last week, indicates that only one G20 country, Canada, ranks among the world’s top 20 open trade markets. ICC also urges the G20 to take a leadership position in the upcoming WTO negotiations in Bali later this year. “If the G20 would demonstrate leadership on our recommendations to conclude a WTO trade facilitation agreement, then we could see world GDP increases of another $960 billion annually – along with more than $1 trillion in world export gains and 21 million new jobs,” said Mr McGraw, citing figures from the Peterson Institute report Payoff from the World Trade Agenda. This year, the primary business input to the G20 process is being orchestrated by Alexander Shokhin, President of the Russian Union of Industrialists and Entrepreneurs (RSPP), who has been appointed by Russian President Vladimir Putin to lead business policy task forces during the Russian G20 cycle. The ICC G20 Advisory Group has consulted with business around the world to secure policy priorities of companies large and small. To date, these meetings have been held in Berlin, Canberra, Mexico City, Hong Kong, Zurich, Qatar, Istanbul, Washington DC, Beijing, Melbourne, Jakarta, Johannesburg, Sydney and Riyadh. “The G20’s expanding policy agenda bears directly on business goals for trade, economic growth and job creation. As the everyday practitioners of the global economy, we have a clear stake in the success of the G20 process,” Mr Carrier said. The ICC G20 Advisory Group comprises approximately 35 CEOs working to ensure that the voice of business is heard by governments, the public and the media before, during and after each Summit. Representatives of the ICC G20 Advisory Group participating in the B20 meetings include: Antonio Brufau, Chairman & CEO, Repsol (Spain), Kimball Chen, Chairman & CEO, Energy Transportation Group (United States), Kris Gopalakrishnan, Executive Co-chairman of the Board, Infosys (India), Alexander Izosimov, Partner, Deep Roots Capital (Russia), Young Tae Kim, Chairman, Daesung (Korea), Harold McGraw III, Chairman, President and CEO, McGraw Hill Financial (United States), Yogendra Kr. (YK) Modi, Chairman & CEO, Great Eastern Energy (India), Peder Holk Nielsen, CEO, Novozymes (Denmark), Michael Smith, CEO, Australia New Zealand Bank, (Australia), Jean-Pascal Tricoire, President and CEO, Schneider Electric (France), Zola Tsotsi, Chairman, Eskom (South Africa), Marcus Wallenberg, Chairman and CEO, SEB (Sweden), Alejandro Ramírez Magaña, Director General, Cinépolis (Mexico) and Yassin S. Al-Suroor, President and CEO, A’amal Group (Saudi Arabia).